In mid May, New York City will be over run with fairs, exhibitions, and trade shows dedicated to design and art. The big events are the International Contract Furniture Fair (ICFF) and the Frieze Art Fair, but there will be literally scores of smaller spin-off events taking place that will be of interest to the architecture community. The Architect’s Newspaper will highlight all of these events in a special May 6 issue. One exhibit and show not to miss is Collective Design’s display—for the first time in a public venue—of a 1960 Le Corbusier–designed tapestry, Les Dés Sont Jetés. This rare tapestry has been in the collection of architect Jørn Utzon, who as an early admirer of Corbu. 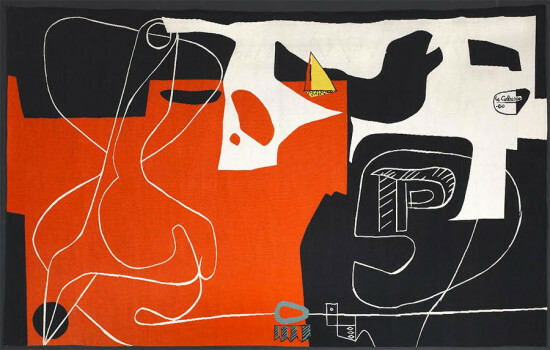 Utzon commissioned Le Corbusier to design tapestries for the Sydney Opera House. It was at this time that Utzon bought the work for his private collection. It will be auctioned at Bruun Rasmussen Auctioneers in June in Denmark, making the 2015 fair a singular opportunity for the public to view the work. Collective Design’s 2015 fair will take place May 13–17 at Skylight Clarkson Sq, 550 Washington Street.